Mention the Chesapeake Bay and you will hear quickly about pollution, run-off, and agriculture. There are countless threats our beloved Bay faces, however, the threat of invasive species is often overlooked. Perhaps this issue is somewhat misunderstood? We find ourselves preoccupied with other Bay issues like sediment and pollution, and the eradication of invasive species tends to not be on the front of our minds. Let us delve in to what exactly an invasive species looks like in the Chesapeake and how we handle the problem. An invasive species is a nonnative organism that sets up shop in a new environment, causing damage and throwing off the natural balance of said environment. This could be a bacteria, a species of tree, or even a bird that reproduces quickly. So, what harm are we seeing because of these visitors? Our native animals are not used to contending with these invaders for food, and often they lose out in the competition. Intrusive creatures also bring with them diseases that animals here do not have immunity to. Two prevalent examples of this in the Chesapeake Bay ecosystem can be found in the mute swan and nutria. Mute swans are native to Eurasia and, to no surprise, are only here because humans brought them over for decoration in the 1800’s. The swans rapidly spread thanks to an aggressive nature that scares off most predators and since then have been consuming copious amounts of submerged vegetation, ruining the ecosystem and even killing off other waterfowl. Nutria, sometimes lovingly referred to as a “swamp rat”, arrived in the early 1900’s when Americans began to use them for fur farms. They reproduce incredibly fast and spread quickly across the Southeast. Similarly to the mute swan, they rip up large amounts of aquatic vegetation and throw off the food chain, as well as cause erosion. By tearing these shoreline plants out from the root, the surrounding soil becomes loose as it has lost its anchorage. The amount of erosion caused by both of these animals is irregular for this area and is filling our Bay with tons of sediment. The only way to effectively remove the threat of these two species is with controlled extermination. The swan population was brought down to less than 200 in Maryland (as required by the Maryland Department of Natural Resources) and was fairly easy to control. On the other hand, multiple methods have been used on nutria to keep their numbers down, which at one point reached between 35,000-50,000 nutria in select parts of Maryland. 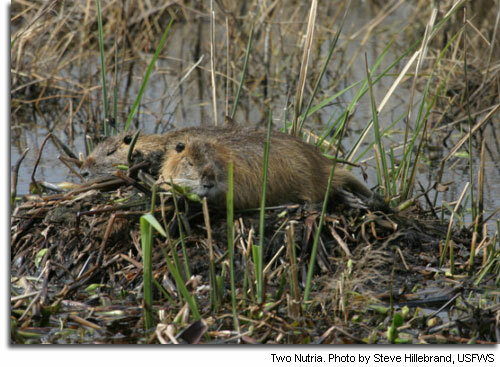 Nutria went through mass population control as well as sterilization to control future booming. Blackwater Wildlife Refuge was hit hard by these nutria populations, however since their eradication, massive turn around and regrowth has been seen in shorelines previously destroyed. Not everyone supports eradication as the best method to deal with invasive species, and rightfully so. However, these actions must be taken in favor of the bigger picture and for the entirety of the ecosystem. While humans are the original invasive species, we have to use our knowledge and self-awareness to make hard decisions, especially when the other option is the loss of our environment. Correcting the mistakes of bringing in these nonnative species is our duty as nature lovers. The handling of invasive species is just as important as addressing run off, fracking, and every other threat to our Chesapeake Bay. We witness the direct and immediate damage caused by oil spills and run off, but for most of us it takes a keener eye to notice the damage done by invasive species. The shrinking of the shorelines to the deaths of other animals in the food chain, all play a large part in protecting the Bay. Without this one piece of the puzzle, the whole picture can never be completed.